Planet Earth. Poor planet Earth. She seems to be quite aflame with inflammatoriness lately. It’s not enough that the jet stream is checking itself into a permanent pattern of unlovely extremity, encouraging even more climactic climate change. No. Peeps like ignorant, silly Marmaduke have to put their egregious oars in the soup (the very hot soup) and stir vigorously. Sigh. As my sainted mother, Mrs On Mars, was wont to say, It is what it is, my dear Last. And while this was usually about yet another plate of not my favourite tuna variety, I got the message pretty quickly. If it is what it is, then we must change its is-ness and practice loving kindness towards our lovely and beautiful Earthly realm. Otherwise, we’ll be in the other realm faster than you can explain why I had to eat all those tins of Acme Tasty (sure it was, eeuggh!) Tuna for Ticklish Tabbies. Hmmph. I’m not a Tabby, or, well, I prefer to think of myself as a universal representative of the meowing species, okay? Okay. Hmmph. Chill. 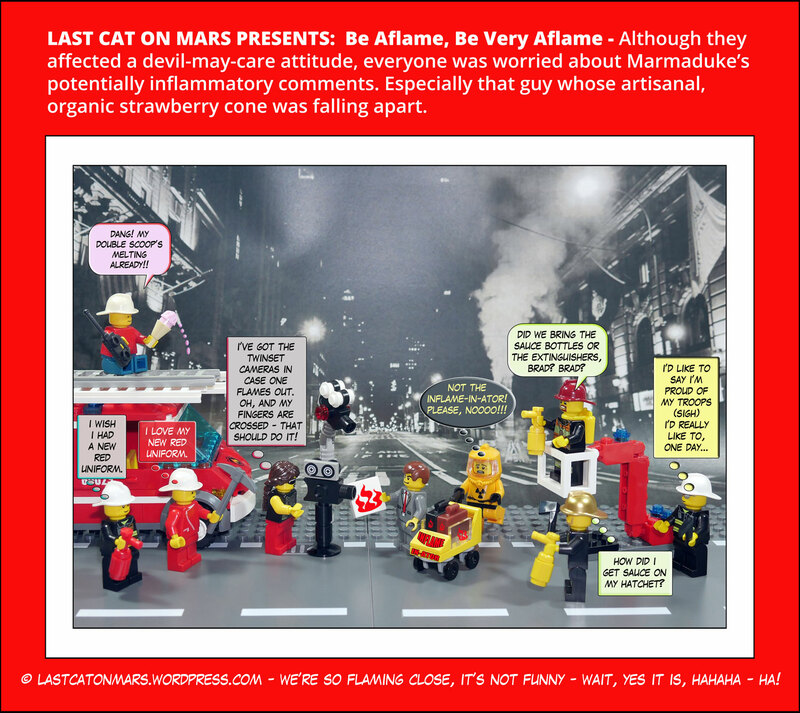 This entry was posted in Variety Show and tagged camera person, cameras, fire brigade, fire engine, inflammatory comments, lego, minifigures on April 5, 2017 by Jay Verney.